With the coming of fall, the Culpeper Center is busy gearing up for two huge headlining events. We’re hosting our 2nd Annual Halloween Bash and our 2nd Annual New Year’s Celebration right here at the Culpeper Center. You can buy your tickets to both events here! Ring in the New Year Here! Check back for photos of our past events, and information about our upcoming events. Buy tickets for future events at the Culpeper Center right here! The Culpeper Center & Suites has established itself as the ideal location in Culpeper to host life’s most memorable events. Starting in 2015, the Culpeper Center & Suites began to host its own events, starting with the Halloween Bash held last October. 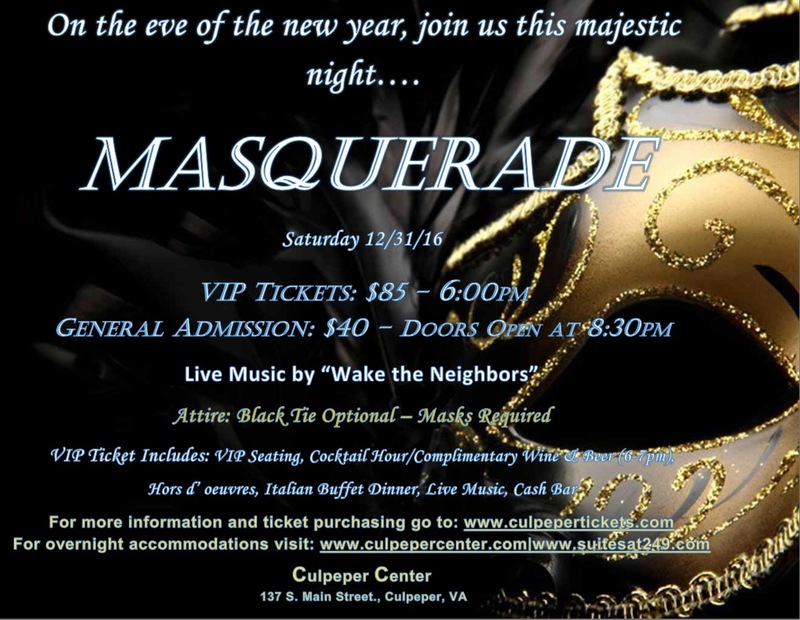 The event was a huge success and the Culpeper Center & Suites followed it up with a Gatsby-themed New Year’s celebration on December 31, 2015. This event was also a huge hit, and the Culpeper Center & Suites is bringing both back in 2016. This year’s events promise to be as good– if not better than– last year’s events. We’re gearing up for an awesome event season at the Culpeper Center & Suites, and we hope you’ll join us! There’s going to be no better party in Culpeper this Halloween and New Year’s. Overnight accommodations available at the Culpeper Center and the Suites at 249, one block away. Space is limited, so book your reservations early.